How Do Pineapples Grow? – He Said What?! Aaron loves fresh pineapple, so he was happy to see the other day that I had bought a nice pineapple at Sam’s. He also loves fruits and vegetables that have unusual appearances, and I do believe that a fresh pineapple would fit under that category. All those spines and that odd, wild growth on top does nothing but stimulate Aaron’s curiosity. Yes, Aaron, I know you do. “When can we eat it,” he asked? So I told him that we would probably eat it the next day. I was chilling out at that moment, watching football, and not in the mood to tackle a pineapple. Well, pineapples grow…………uh, they grow………..I think they grow………….you know, I’m not exactly sure. 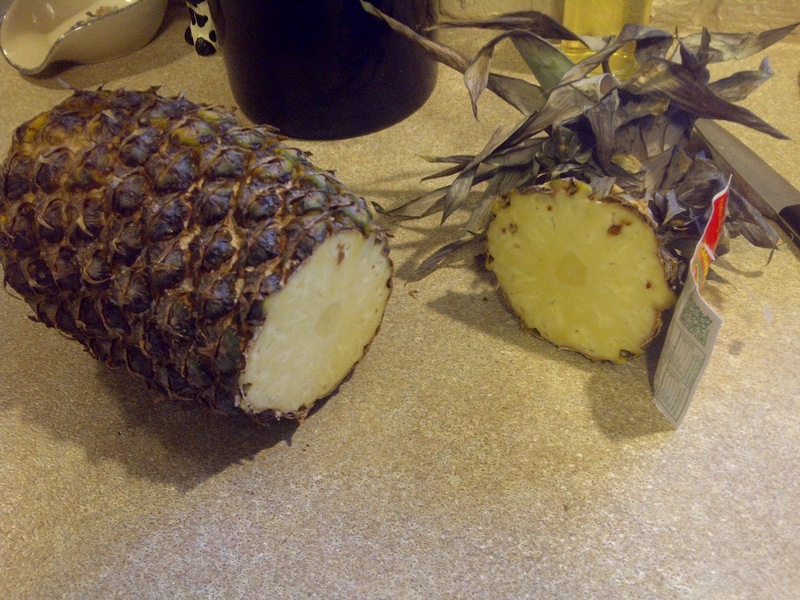 And this is why you would have found Aaron and I sharing my tablet screen, looking at various pictures of pineapples and how they grow……….while Aaron excitedly rubbed his hands together and held his special fresh pineapple in his lap. Yesterday morning, you can be assured that Aaron talked again about that pineapple……how it grows, where it grows, what it tastes like, and making sure that I had not forgotten that I had said we could have the pineapple that night. Aaron returned from his group a little late and found me in the midst of cooking supper. He talked a few minutes about his day before he went over and grabbed the pineapple, placing it on the counter in front of me………….to remind me that I had said we would eat the pineapple………..tonight! Aaron, you open the pineapple by cutting it! And he once again urged me to open the pineapple as he scrambled up to his room. He was full from his day of eating who-knows-what, but later as we played Skip-Bo, he had himself a nice bowl full of the pineapple that I had opened for him. I had to remind him several times to chew with his mouth closed as he chomped that open pineapple. This morning, he came into my room and began talking about the open pineapple, and how it looked rotten because of the color on the outside………….but it wasn’t rotten, right?………….and how good it tasted………..and could he have some for breakfast. He managed to polish off the remainder of our open pineapple this morning, enjoying every bite. Believe me, I know………because he carried his bowl up to my room, and chomped and slurped once again while I finished getting ready. Aaron sure can take something as normal as a pineapple and make it into a very interesting experience. We’ll have to open another one soon!